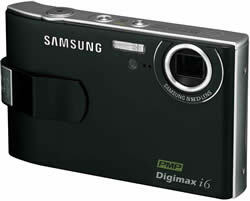 Samsung Digimax i6 digital camera features 6-megapixel CCD, 3x optical zoom, Advanced Shake Reduction (ASR) anti-shake technology, 230, 000 pixels color TFT LCD, integrated MP3 player. Samsung Digimax i6 also dubbed “world’s first PMP (Portable Media Player) slim camera” as it can also playback movies and video files, beside plays MP3 mentioned above. Other specifications include super macro mode at 1 cm, numerous special effects, color effects, and shooting modes, and ability to record VGA movies at 640 x 480 at 30fps in MPEG-4. Samsung i6 also comes with Digimax Converter software that can convert MP3, WAV, MPEG, AVI, MOV, WMV, and ASF files for viewing on the Samsung Digimax i6. DigiCamReview recommends Samsung Digimax i6 and concludes with rating of 8.3 out of 10 that Samsung Digimax i6 is a great ultra compact digital camera. It provides good image quality with very richly saturated colors, has a great screen, and a built in 3x optical zoom lens. The camera is fairly easy to use if you can get used to the menu system. It feels well built in comfortable to use. The camera is a very complete package, there really is very little missing from this digital camera, it has an excellent macro mode, an excellent screen, video and audio recording, custom white balance, and built in advanced shake reduction. If you are in the market for an ultra compact digital camera with built in MP3 playback or built in video player then there is very little else to choose from. The digital camera would be very good value for money without the MP3 player or PMP, but with these features it’s excellent value for money. The camera does have some minor flaws, such as the wobbly connection on the bottom, and the confusing menu system, but if you can look past these issues then this is an excellent digital camera.